This is the easiest appetizer or snack to make. 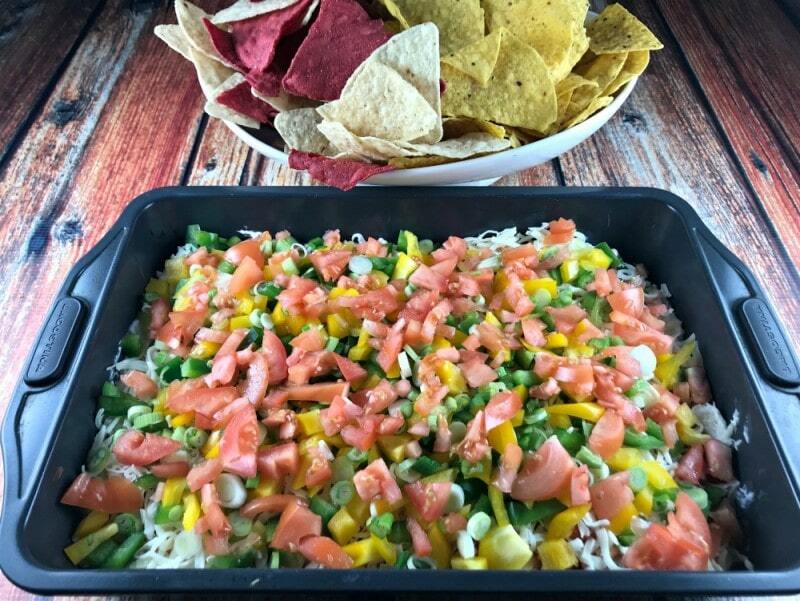 This Simple Seafood Dip is so good! We made this the other night while watching a hockey game and enjoyed every last bite of it! To be honest, sometimes I skip the peppers or tomatoes, if I don’t have any in the house. I always keep a couple cans of crab and shrimp in the cupboard and have this delicious snack ready in no time at all! I can’t remember ever having any leftovers! Simple Seafood Dip is always so yummy! This dip can be served in a prettier dish as long as it is around this size. You need to make sure that you have a little bit of everything in every scoop! 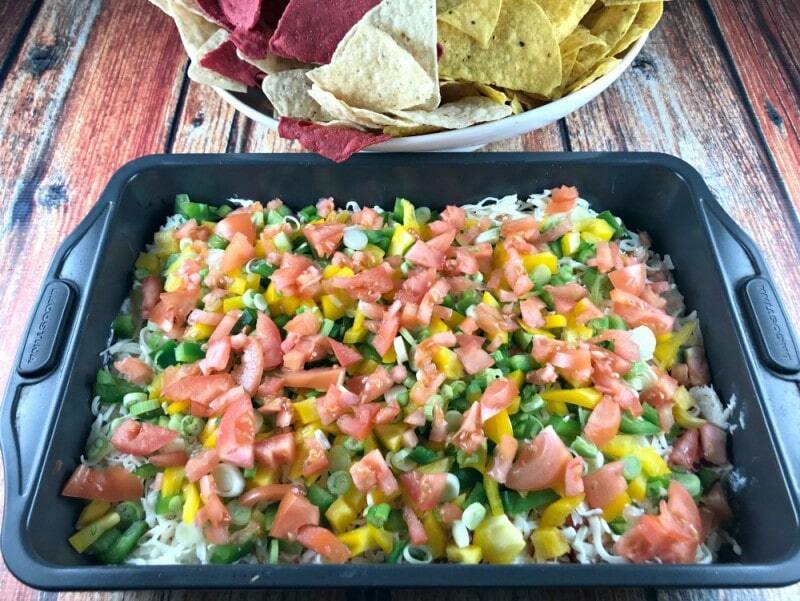 You also want to serve this dip while it is cool but not right out of the refrigerator. If this dip is too cold the chips always break while I am scooping and that drives me absolutely crazy! I always leave it out for about 15 to 20 minutes before I serve it. Just to avoid this problem. My son Patrick disagrees and just tells me to buy thicker or stronger chips. I think he is just impatient and can’t wait! Either way you will enjoy it. We always do! Take a peek at our video. At least you will be able to see just how easy this Simple Seafood Dip is to make. In a medium sized bowl combine cream cheese, sour cream, crab and mayonaise. Usind a handheld or stand mixer blend together until totally combined. Next, grab a 13x9 inch pan and spread cream cheese mixture across the bottom, as evenly as possible. Sprinkle shrimp over top of the cream cheese mixture, again, as evenly as possible. 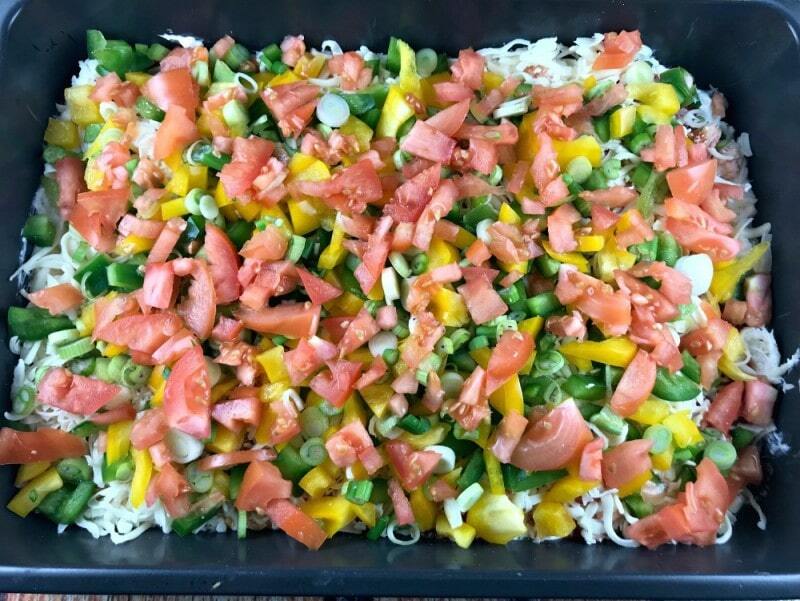 Continue with seafood sauce, cheese, peppers, onions and tomatoes. In that order. Refrigerate until ready to eat! Serve with chips or your favorite crackers for scooping. Enjoy!